Both Whole Food Stores in Baltimore – Mt. Washington and Harbor East have enticing yet traditional selections of foods for your Jewish High Holidays: Rosh Hashanah and Yom Kippur. Why do all the work when Whole Foods has such a varied selection. (see menus below or click HERE). You can order ahead or come in to either location in Baltimore to the prepared food departments. 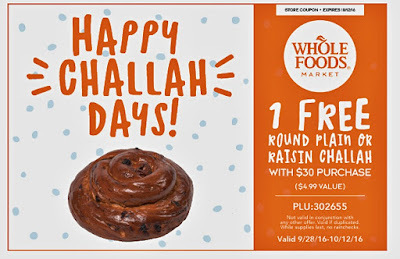 In an exclusive partnership Whole Foods Baltimore and www.DiningDish.net we has created an opportunity for you WIN a “Break the Fast” Yum Kippur meal for 6-8 people. The contest is simple, peruse the menu, list one item you would like to have on your “break the fast” table from the Whole Foods menu, share the DiningDish.net post and use the hashtag #breakthefastWholeFoods. Post on Facebook, Twitter or Instagram for a chance to win. The winner will be chosen Monday, September 29 by the folks at Whole Foods. The more you post the greater the chance of winning. The winner will be connected to the most convenient Whole Foods location in Baltimore to get the final details of the prize.